Dying of a broken heart is just the beginning.... Welcome to forever. BRIE'S LIFE ENDS AT SIXTEEN: Her boyfriend tells her he doesn't love her, and the news breaks her heart—literally. So Lauren Oliver blurbed this book. If you are in the young adult community- that is a big deal to have Lauren Oliver blurb your book. 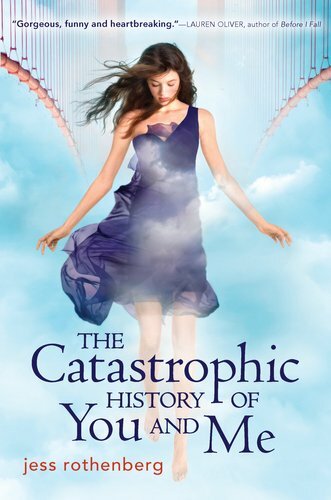 I had high expectations going into Catastrophic History and that blurb is why. Lauren nailed the description of the book: "Inventive, funny, beautiful, heartbreaking". Those are the exact words I would use to describe it (if that wasn't total copying!) I have never read a book like this- it was like Teen Angel plus that show Revenge on ABC. Man, the drama was palpable. The book was somehow sad and dramatic without being dark. There were many funny and carefree moments throughout the book that kept it from tipping into the depressing. I loved the characters and loved the journey that Brie goes through. This book is really about Brie (but really really about something else that I am not telling you!) and her journey through the stages of grief from her own death. It was a bittersweet read that has a wonderful finish. I would say even if you aren't a fan of contemporary ya (which I typically am not)- you will still love this book. The author rides the line between fantasy and contemporary fiction with skill and ease. I loved this book and I can't wait to read more from this very talented author! awww I can't wait for this one any longer! This sounds like a wonderful read. Your review really puts it up on my radar for sure. Gasp! I've been wanting to read this one, and yours is the first review I've seen for it. I'm so glad that you liked it. Great review! IDK, the idea of a girl dying of a broken heart seems a little weird to me. I like contemporaries, the cover and Lauren Oliver so, maybe I will check this book out. It's out now and it seems like a lighter version of Lovely Bones--that is a TOUGH book.